Wednesday is [tag]National Signing Day[/tag] and we’ll have frequent updates throughout the day on the 40 Acres. 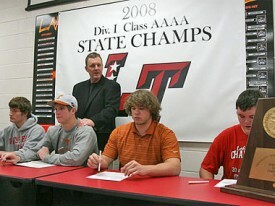 This is the first day high school senior recruits can sign a binding letter of intent to play college football. 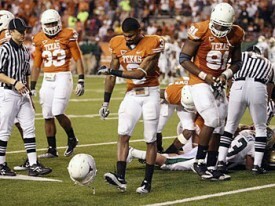 The Longhorns have 20 commits in the 2009 class with 8 already on campus and 12 expected to send in their LOI tomorrow. We’ll have updates when those letters come in as well as the important news on the two remaining targets, linebacker Jarvis Jones and corner Dre Kirkpatrick. Follow @40AcresSports on Twitter (after the jump) and keep track of other #signingday news as well. ESPN has posted several good videos and articles on the future Longhorns participating in this weekend’s Under Armour All-America Game. Players like [tag]Garrett Gilbert[/tag] and [tag]Mason Walters[/tag] are getting the chance to impress on a national stage and according to Bobby Burton of Rivals.com Gilbert in particular has done so. With five future Longhorns in the game they’re also getting an early opportunity to hang out together, something that will help the group hit the ground running once they get onto the 40 Acres. Mason Walters is 6-foot-7 and nearly 300 pounds. Still, the physically imposing offensive tackle is dwarfed by the larger-than-life expectations that constantly surround the football team at the University of Texas. As one of five Texas commits participating in Sunday’s Under Armour All-America Game (ESPN, 7 pm), Walters is a principal member of a Longhorns recruiting class that is tall on talent. He says despite each individual’s ability, the group puts a single goal — a collective goal — at the top of its New Year’s resolutions. Under Armour All-Americans Garrett Gilbert, [tag]Paden Kelley[/tag], [tag]Thomas Ashcraft[/tag] and [tag]Barrett Matthews[/tag] will be joining Walters in Austin next year. Together, they constitute the core of a class that has nine players in the ESPNU 150 and was ranked third in ESPN.com’s most recent breakdown of the top recruiting classes. Love to see the kids bonding as this group of guys along with the players at the US Army All-American Game will make up the core of future Texas teams. You can catch Under Armour practices on ESPNU this week and the game will air live Sunday night at 7pm.